I used to buy a lot of Craftsman, then for a while I wouldn’t buy anything Craftsman. I probably would not have bought this, except that they were the only local retailer that had 1 in stock. I saw several online, but due to my poor planning I didn’t have time to wait for shipping. I needed it to drill holes into wall studs for floating shelves. I used 3/8” x 8” lag bolts to support the shelves. Once before I tried that without a drill guide. It did not end well. 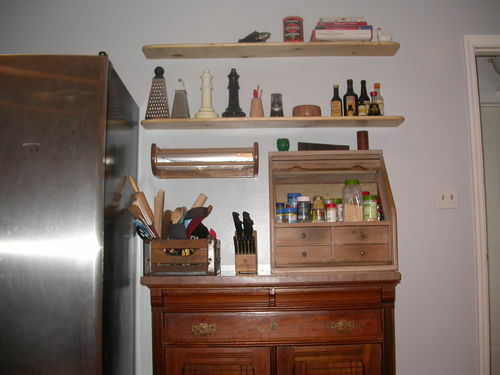 It’s the easiest, cheapest way to make floating shelves. Drill the holes, screw in a lag bolt, cut the head off the bolt, drills holes in the end of the shelf and slide it onto the bolts. I take the bolts out , cut off the heads, reinsert with vise grips. Right out of the box I bolted on a board scrap to make the base bigger. Maybe it didn’t need it, but it performed very well with it. There is a lot of plastic and the chuck is 3/8” . Some that I saw had locking positions for the angles. This has a line on the column that you align with a line on the base. I give it 5 stars , for light duty use. Here's a link. I think my shelves turned out good. Glad to hear the tool is working well enough for you to get 5 stars. I was reading where you’re using lag screws and then cutting of the heads. There is another way you may find easier. Purchase some combination thread screw studs. They should have machine screw threads on one end and wood screw threads on the other. Take two nuts that fit the machine screw threads, lock them together so you can use a wrench or socket to install the studs into the wall. Once at the desired depth into the wall, use two open end wrenches to remove the nuts. 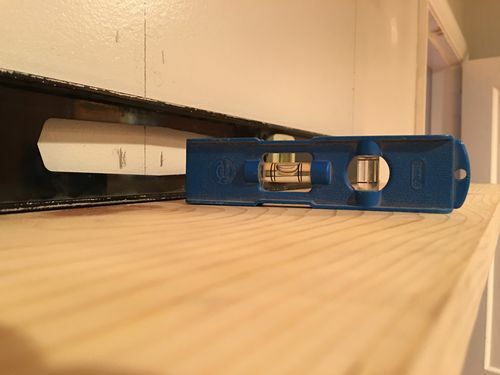 They should save you some installation time and eliminate the possibility of scratching the wall when cutting off the lag screw heads and any filing to clean up the studs after using vise grips on them. The combo machine screw/wood thread stud bolts were the first thing I thought of when I read your description, as Darrell has pointed out. I keep a bunch of them around – they come in handy for all sorts of things when you want to hook something to a stud, inside of a table frame, etc. 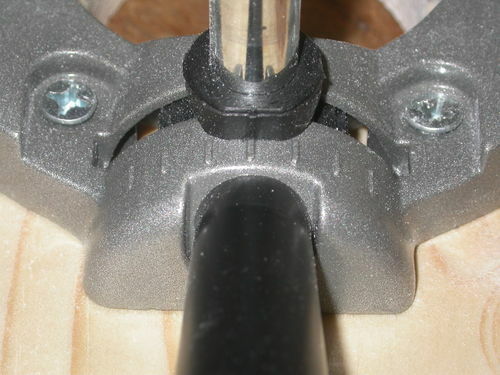 They are the studs you see on some tables underneath, where they wood screw it into the corner of the frame underneath, put the leg assembly on the bolt, and use a standard nut and flat washer tightened to the bolt to hold the leg assembly to the frame. 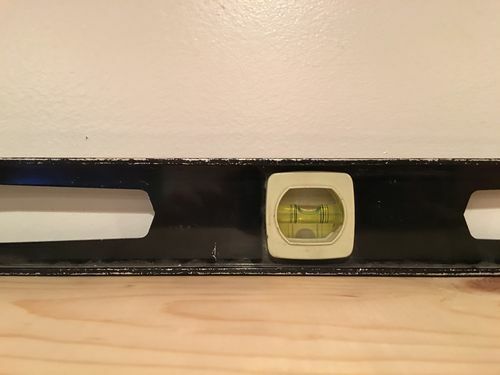 In this case, you could have drilled your usual hole in the shelf, and put in a counter hole so you could thread on the nut from the bottom of the shelf when you put it on. But in any case, great look on the shelves and nice project, but I still won’t buy Craftsman. The sheer fact you felt the need to modify it to make it better, right out of the box is enough for me to stay away. I don’t get how the attachment works. I don’t see how it plunges. Does the drill turning make it screw downward? 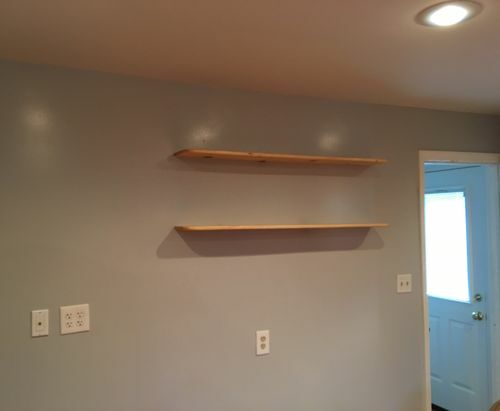 You review is more about the shelving than the tool. You put a bit in the chuck, attach the chuck to the drill and push down to drill. The spring pushes it back up. The guide maintains level and square while drilling. The link gives a good description of what it does, the shelves are proof it does what they say it does. Hanger bolt is the name of the stud things you’re talking about. I didn’t find 3/8” x 8” on store shelves, wasn’t going to wait for delivery. 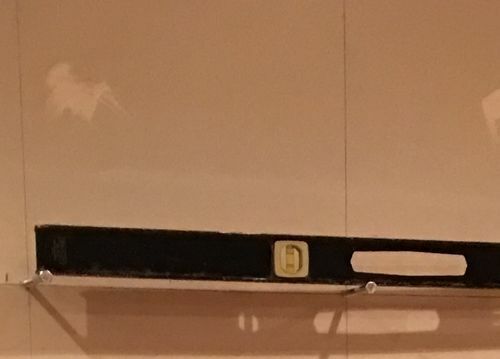 The bolts were taken out for painting the wall. I cut the bolts heads off in a machinist vise with a whiz wheel and rounded over the cutoff end in a bench grinder. Simple is best for me. Vise grips work well for this purpose. New tools are modified all the time. How many tablesaws come with a sled? Hairy, I was really hoping that this was a beefy system. I bought a milescraft version of this, but it was too light duty and ended up broke. I love the idea and was hoping Craftsman was selling a better version. Mike, I’ve gone back and searched more after using and posting this one. From what I’m seeing there isn’t a lot of difference between all of them. Some have better markings for angles, I saw 1 with dust collection, every one I saw is 3/8” chuck. I did see a Milescraft and a Wolfcraft that appear identical to this one, except for the color of the plastic, and they were about $10 more. I think those makers have more than 1 model. I would have liked to find one made of all metal, 1/2” chuck with locking angle positions. I couldn’t find anything close to that. I believe that they are all light duty, some lighter than others. If someone knows of it, let me know. Good review, nice project and thanks for the links Hairy! The Old Porta-Line drill Guide was al made of metal but I don’t think it had a tilting ability.